We’ve recently been doing some behind-the-scenes overhauling of the site, cleaning up old links, testing a new recipe plugin, that sort of thing, and I found myself looking at one of the first articles I ever wrote for the blog, in 2013. 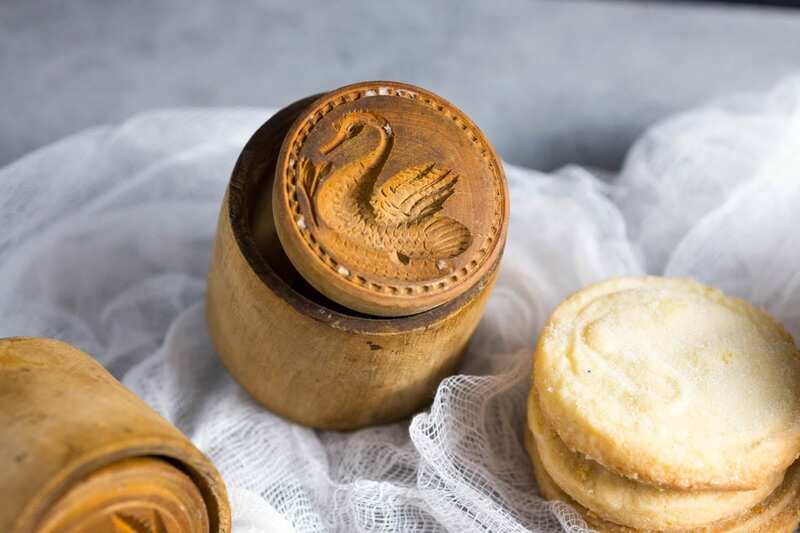 In it I talk about finding three wooden biscuit stamps at my grandmother’s house after she died. Her kitchen cupboards were seemingly endless and there was always something at the back that you never knew was there. Into the 90s I swear we were still finding foodstuffs at the very back of the larder with halfpence prices (which were phased out in 1983). Certainly I don’t remember ever seeing, let alone Nan ever using, these stamps. So, just to recap, the stamps are, at first glance, a shamrock, a thistle, and a dragon. If you’re British, you’ll be saying “yes of course, that makes total sense”; if you’re not, you will probably be singing the “One of these things is not like the other” song from Sesame Street. Okay, just for you: our national symbols are charmingly slapdash. Unlike the United States, wherein every state has a state flower, a state bird, a state peanut butter brand for all I know, the UK has been making all that stuff up as it goes. As symbols go, England has a rose (OBVIOUSLY); Scotland, a thistle (to match that rugged Braveheart / Outlander aesthetic); Ireland, a shamrock (they’re just owning that whole look), and Wales, a dragon. Well, it also has a leek, but frankly, if I were Welsh, I’d pick the dragon too. Shall we choose a flower that grows particularly well in our native soil? No, let’s pick a huge flying fire-breathing MADE UP CREATURE. So yeah, that’s Wales. Bearing all that in mind, I naturally thought I was looking at three of possibly four original stamps, with the English rose having gone missing at some point. I was still curious about their provenance, so I did a little Google image searching, and oddly wasn’t able to find any mention of a similar dragon-themed stamp, other than one expired eBay post. However, I did find this listing for an antique butter press, which, while not exactly the same, is – okay, it’s almost exactly the same. And … it’s a swan. Swan or dragon? You be the judge! No. What? It is not a swan. Is it? It’s a dragon! Look at its spiky head! Its scaly body! The elongated jaw! The squinty eyes! (If I were a dragon, I’d probably be squinting most of the time against all the steam or whatever.) Anyway, a swan doesn’t fit my narrative of British symbolism. There was only one thing for it. I would have to make some shortbread and look at the finished biscuit to figure out what it was supposed to be. The fact that I’ve never blogged a shortbread recipe came as a bit of a surprise. I went back to a favorite standby, good old Cook’s Illustrated’s “Baking Illustrated” where they, of course, spend several pages describing how they experimented with the recipe, first using so much flour, then trying various temperatures of added butter, and they probably tried mixing the whole thing using a willing otter’s paws (“we concluded that the result did not sufficiently improve upon using an electric food processor, so we thanked the otter for her service and she went on her way”). I happened to have pretty much all the ingredients, with the slight variation that I only had King Arthur flour to hand (11% protein, as opposed to the more recommended 6-8% to achieve the best shortness). 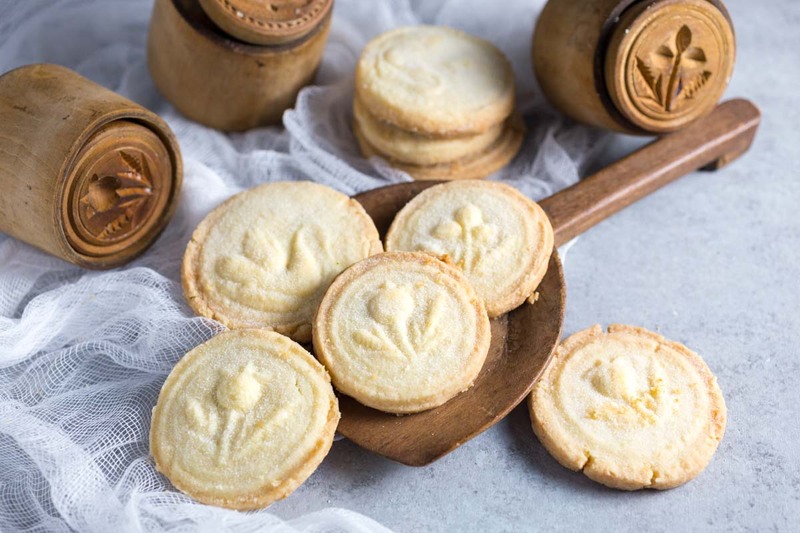 Cook’s Illustrated, like many shortbread recipes, uses a 1:2:3 ratio of sugar:butter:flour (for example, 1/4 cup sugar, 1/2 cup butter, 3/4 cup flour) and uses rice flour to form about 1/3 of the total flour amount. 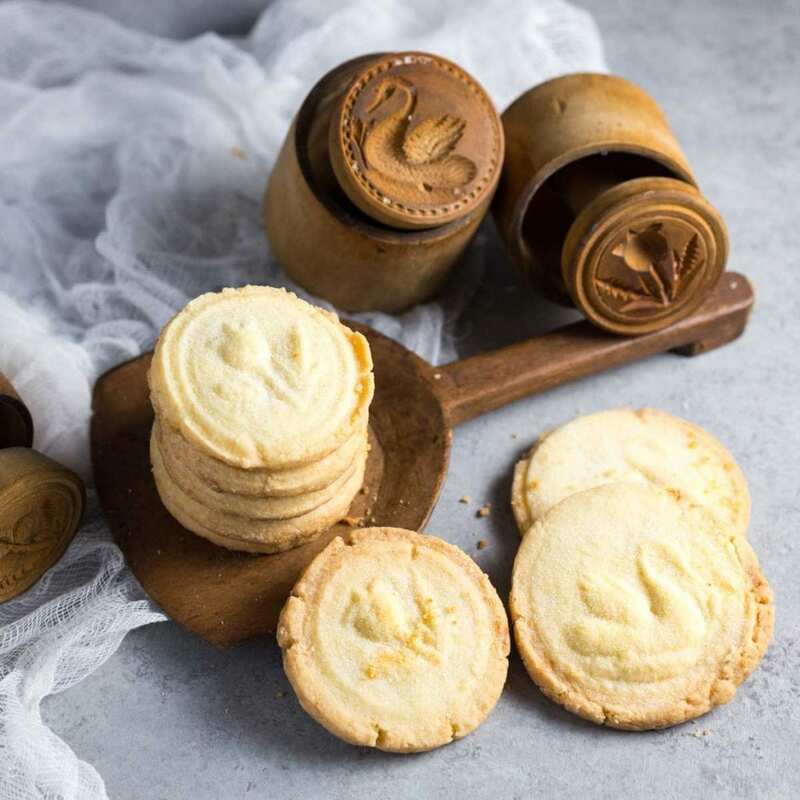 (The rice flour helps to keep the shortbread – well – short, preventing too much gluten buildup). These cookies are crisp and wonderfully buttery. While the pressed image is pretty, they taste just as scrummy without them. My first batch was not a disaster (let’s face it, I ate all those biscuits, and I’d do it again), but they spread out much too much, losing all their definition. I also felt they were just a tad too sweet. I changed two things. The brand of unsalted butter I’d used in the first batch was a cheap store version, which in previous bakes we’d found contained a lot of water. So I switched it out for pricier Plugra (you can look for other European brands, or Land O’Lakes in the US should also work well). The second thing I did was increase the amount of flour so that the total sugar:flour ratio reached 1:4 instead of 1:3. You’ll notice that the biscuits in the photos are a little dark at the edge, and when I make these again I’ll adjust the oven temperature downwards (I baked at 350F; I’m recommending 325F) and lengthen the bake. I’ve already adjusted the times in the recipe below, but you should check your biscuits throughout the bake as oven temperatures can vary. You really shouldn’t see too much coloration at all. This recipe makes about 10-12 biscuits depending on size. Mix the flours, sugar and salt in a food processor on low for 30 seconds to combine. Cut the butter into ½-inch cubes and toss in a medium bowl with ¼ cup of the flour mixture. Return butter and flour to the rest of the flour in the food processor. Mix on low for 3-4 minutes until butter has been incorporated into crumbs. If the mixture starts to clump, stop mixing. Turn onto a work surface and gently form into a flat dough, about half an inch thick. You can use a rolling pin or press with the bottom of a glass to flatten the dough. 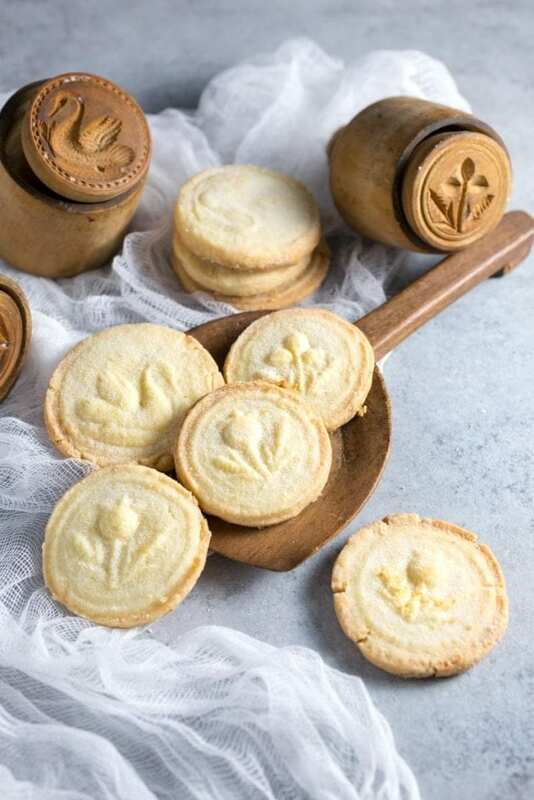 Using a cookie cutter, cut into rounds. Use a stamp if you have one to form a design! Use a spatula to move the biscuits to the paper-lined tray. Leave some separation between the rounds in case of spreading. Bake for 20-25 minutes. Watch the biscuits towards the end of the bake to make sure the edges do not color. They’re gorgeous! I’ve bought some stamps like these (on ebay) to use on clay. Fun, right?